The NavAtlas NA605BT digital media receiver gives you outstanding sound, an extremely powerful built-in amp, and Bluetooth® connectivity, plus a NOAA weather band tuner, a 3" color LCD screen, and Pandora control. With tons of cool features and marine-rated reliability, it's an outstanding value. You won't need an outboard amp to drive your powersports speakers. The NA605BT features a built-in Class D amp that delivers a whopping 55 watts RMS per channel, plenty of power to overcome wind and engine noise. You'll also appreciate the sound-shaping tools, which include a 3-band parametric EQ and 7 preset EQ curves, plus 2-level loudness control with adjustable frequencies. If you want to add some bass, you'll find a set of sub outputs for controlling your marine subwoofer. There's no CD player in the NA605BT, so you can leave your discs at home and enjoy your much larger (and lighter!) digital music collection out in nature. With built-in Bluetooth, you get the safety and convenience of audio streaming with compatible smartphones and music players. 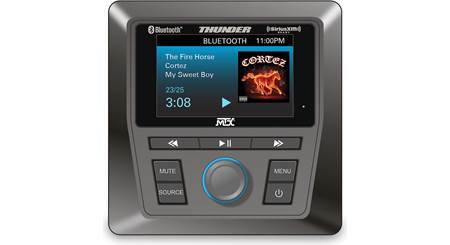 You'll enjoy plenty of options for entertainment and information with this receiver, highlighted by direct USB control for iPod® and iPhone® devices. You can also listen to your favorite AM/FM stations, play music stored on a USB drive, or plug a portable player into the AUX input. You can mount the included USB extension cable in a convenient spot, making it easy to connect your device and crank some tunes. NavAtlas made the NA605BT to survive the extremes of life in the great outdoors, with a UV-resistant exterior that resists fading, a detachable faceplate, and a conformal-coated PC board that resists corrosion. All the openings are protected from the elements when not in use, and you can control all functions (except for Bluetooth) with the included remote. The 3" LCD display is easy to read day or night, and you can detach the face when you leave your ATV and store it until you're ready to hit the trail again. NavAtlas includes a rear-view camera input so you can add a layer of safety to your ATV or side by side. The 7-band NOAA tuner tells you what the weather's doing wherever you are. Installation notes: This radio is water-resistant, but we recommend mounting it in a water-resistant enclosure or using a cover for best performance. Put this on my Harley with no need for a amp. Is this unit IP rated for water resistance? Rugged Outdoor Design: The NavAtlas NA605BT digital media receiver features a rugged design that holds up to the outdoor and marine environment for water and motor sports. UV Resistant Construction: The faceplate and other exposed elements of the receiver are carefully injection-molded using high-temperature ultraviolet resistant resins, preventing them from breaking down in the sun and giving you peace of mind to enjoy your music on the water even during the sunniest of days. PET Wrapped Chassis: This tough, direct, and moisture-resistant layer of PET (Polyethylene) wraps the top and sides of the entire chassis, providing an additional measure of protection from the harsh marine elements. EDP Chassis: Applied using an electrical charge, EDP (Electrophoretically Deposited Paint) offers unparalleled protections against corrosion and rust resistance. All exterior metal surface including chassis, heatsink, and mounting sleeve undergo this process to ensure a long life in the marine environment. Conformal Coating: The conformal coated main circuit board has a transparent protective film applied to all surfaces. This additional layer of defense guards against dust, condensation, and corrosion - ensuring maximum longevity. Nanofics Coating: The front printed circuit board (PCB) includes an ultra-thin Nanofics coating to provide a high-level of water and oil repellency. This protects against corrosions and short-circuiting caused by humidity and water splashes, without impacting device performance. Fold-Down Detachable Faceplate: The NavAtlas NA605BT employs a fold-down detachable faceplate to deter theft. A hard plastic face case is included to store the detached faceplate. An optional soft face case (142DFC1X, sold separately) can also be purchased for this unit. 3" Full-Color LCD: The NavAtlas NA605BT digital media receiver features a 3" full-color LCD screen which displays song/artist/album information (not album art), station identification, clock, and menu settings. You can adjust the brightness of LCD from 1-7. 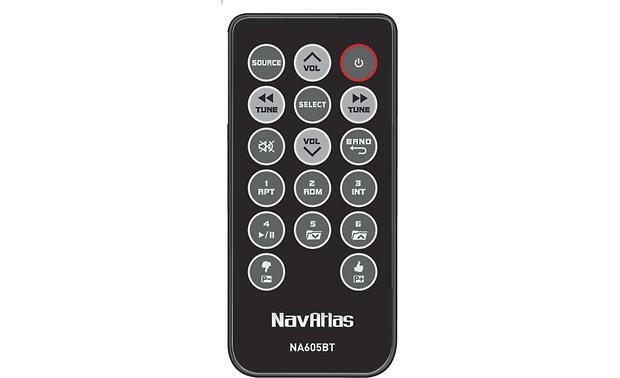 IR Remote: The NavAtlas NA605BT comes with a 17-button IR remote for wireless operation of the digital media receiver. Optional Handlebar Remote: The NA605BT is compatible with the NavAtlas handlebar wired remote control (145BWR25, sold separately). Bluetooth Audio Streaming: The NavAtlas NA605BT is equipped with built-in Bluetooth 2.0 with A2DP and AVRCP support. You are able to wirelessly stream stored music and music apps from your Bluetooth enabled smartphone or tablet to the digital media receiver, as well as control basic playback functions (such as Play/Pause & Previous/Next Track) from the head unit's front-panel controls. The NA605BT will also display song/artist/album information (no album art). Note: This unit does not support Bluetooth hands-free phone communication. USB Port: The NavAtlas NA605BT features a rear-panel USB (type-A) port and comes with a 6.5' USB/Aux extension cable, so the USB jack can be mounted up front for easier access. The USB port supports connection of a USB mass storage class (MSC) device, like a thumbdrive or portable digital audio player. You can play back MP3 and WMA music files stored on a compatible USB MSC device. You'll be able control music playback functions, as well view song/artist/album information (no album art) from the head unit's front-panel. USB devices that can be charged via USB will be charged when plugged into the receiver's USB port (max. 1A), and the vehicle's ignition switch is set to ACC or On. Note: The unit's USB port is not compatible with Android and does not support USB hubs or card readers. Direct iPhone Connection: The NavAtlas NA605BT also supports direct connection of select Lightning and 30-pin Apple devices through its USB port. Simply plug in your compatible Apple device using a "Made For iPod/iPhone" certified Apple Lightning or dock to USB cable (sold separately). You'll be able to play back stored music and music apps on your apple device, control playback and search functions, plus view song/artist/album information (no album art) through the digital media receiver. You can also choose to control your iPod/iPhone through its own clickwheel or touchscreen. During connection, the battery of your Apple device will also be charged, as long as the vehicle's ignition switch is set to ACC or On. Pandora Internet Radio: The Pandora App (for iOS) lets you play music from your Pandora music service account through the NavAtlas NA605BT using your USB-connected Apple iPhone (iOS 9.0+). 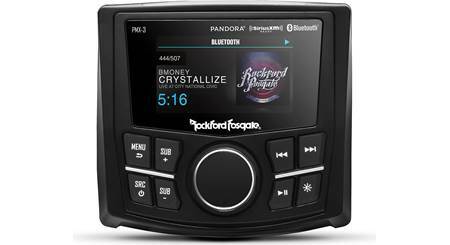 The NA605BT provides control over the Pandora music service and displays artist/song/album information (no album art). You can select Pandora stations from your station list and sort them by date or alphabetically. You can also skip song tracks within a station. You can even give songs a thumbs up or thumbs down. Your iPhone will need an active Data Plan account with connection to the Internet via 3G, EDGE, LTE (4G), or WiFi. Note: Access to the Pandora will depend on the availability of a cellular and/or WiFi network for purposes of allowing your iPhone to connect to the Internet. AM/FM Tuner: The NavAtlas NA605BT is equipped with a built-in AM/FM tuner. You can store up to 30 station presets (18 FM and 12 AM). You can tune your presets manually or have the head unit do it automatically. The Local function allows only strong radio stations to be received, blocking stations with weaker signals. The unit also offers RDS and North America or European tuning. North America or European Tuning: You can switch the tuner between North America or European tuning. 7 Channel NOAA Weather Band Tuner: The built-in 7 channel NOAA weather band tuner lets you stay ahead of stores and adverse weather conditions while out on the water. NOAA Weather Radio is a nationwide weather system that broadcasts local weather emergency information 24 hours a day. The US network has more than 530 stations covering the 50 states as well as the adjacent coast waters, Puerto Rico, the US Virgin Islands and the US Pacific Territories. Aux Input: The NavAtlas NA605BT digital media receiver is outfitted with a rear-panel stereo RCA aux input and comes with a 6.5' USB/AUX cable which terminates into a front-mounted 3.5mm Aux jack for easier connection of a portable audio device. 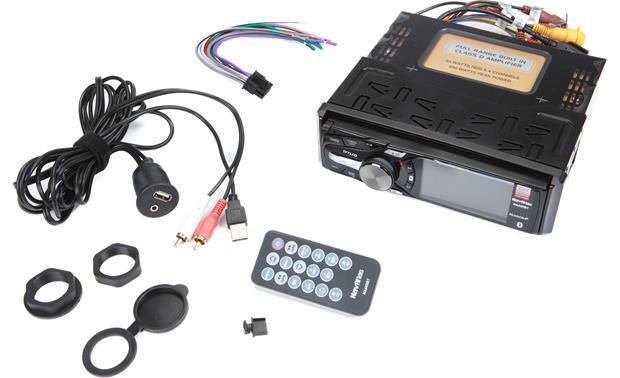 Camera Input: The NavAtlas NA605BT features a camera input which consists of a female composite video jack that allows you to connect a backup camera (sold separately) to the receiver. There is also a reverse gear wire which allows for automatic switching of the camera input when your vehicle is put into reverse. The backup camera's image will be display on the receiver's 3" LCD screen. 55W x 4ch Class-D Amplifier (CTA-2006 Rated): The NavAtlas NA605BT digital media receiver is equipped with a high-powered, highly efficient Class-D amplifier. The power specifications for the NavAtlas are compliant with the CTA-2006 Mobile Amplifier Power Testing and Measurement standards from the Consumer Technology Association (CTA). 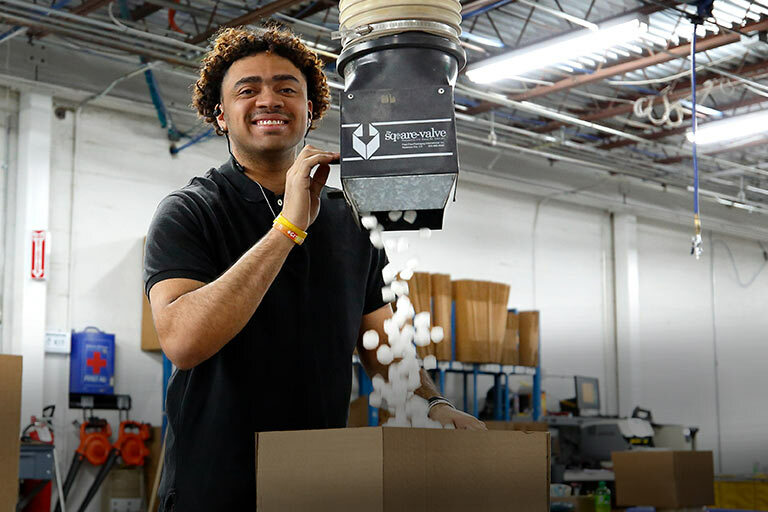 These standards were developed as a way to equitably compare power specs from model to model and between manufacturers. Note: Because of its high-powered amplifier design, the NA605BT does require that a separate +12V constant power wire is run to the battery with a separate inline 30A fuse in vehicles with lower than a 30A fuse protecting the factory radio. 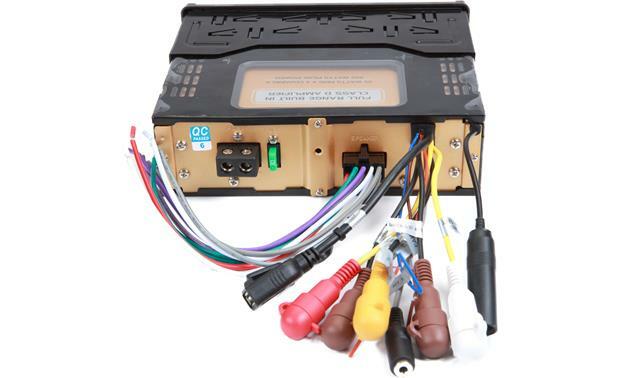 Check out the "Accessories" tab for wiring kit. This NavAtlas high-powered receiver won't work in systems where an outboard factory amplifier is still active. 4V Sub Pre-Out: The NavAtlas NA605BT is outfitted with a 4V subwoofer pre-out for connecting a powered sub or mono subwoofer amplifier. The subwoofer pre-out features a variable crossover that can be set to 80Hz, 120Hz, 160Hz, or Off (full-range). You can adjust the volume level (0-12) of the subwoofer pre-out independently from the receiver's overall volume. EQ: Choose between 7 preset EQ curves - Pop, Jazz, Classic, Beat, Rock, Flat, or User. 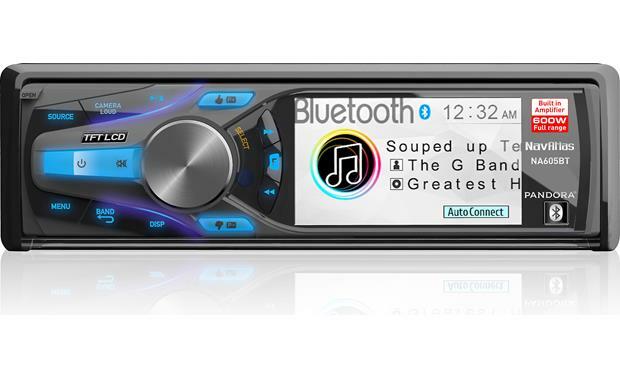 The User setting allows you to manually adjust the receiver's Bass, Midrange, & Treble. Loudness: This function enhances low and high frequencies to make the sound clearer at lower volumes. The Loudness feature can be set to High, Low, or Off. Source Level: You can increase the relative volume (+/-6dB) of the unit's source inputs to match the external source's output level. 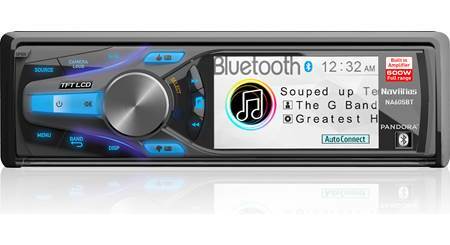 The Source Level can be used for Tuner, Aux, Bluetooth, USB, iPod, and Pandora. Programmable Turn-on Volume: You can program the NA605BT to turn on with the volume at a preset level, instead of the same level as when the head unit was turned off last. This prevents possible speaker damage or a startling surprise when the receiver first turns on at a high volume level. Beep Confirmation: An audible beep tone confirms each function selection. The beep tone can be disabled/enabled in the Setup Menu. Don't buy this unit. Remote only works if you are to the right of it. Volume knob blocks remote sensor. Remote also only works when you are very close, in other words worthless! Dual is marketing the same unit at $100 cheaper. Much better values out there. Would send it back if it wasn't a pain to get out, etc. 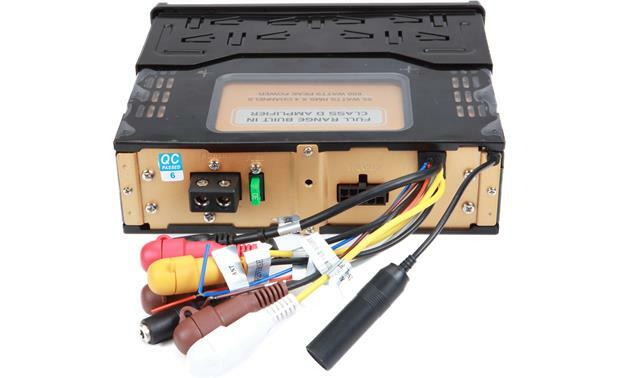 Searches related to the NavAtlas NA605BT Powersports/marine digital media receiver with built-in Class D amp (55 watts RMS x 4).